Warrick Bishop: Hi, my name's Dr. Warrick Bishop, and I'd like to welcome you to my podcast channel. Today I have the absolute privilege of interviewing James Nevile from Amcal, he's a senior pharmacist there. In fact, he's been in the pharmaceutical industry for over 20 years, with extensive experience providing the highest level of trusted advice for Australians. He's passionate about providing the best possible advice and information to Australians and continuing this mission for many years to come. James, it's an absolute pleasure to have you here today, and welcome, and hello. James Nevile: Thanks for having me on, Warrick. It's great to be here. Warrick Bishop: Look, I'm really excited to have you here, and I'm very excited to talk about Amcal's 2018 Heart Health Initiative. Can you tell me a little bit about what initiatives Amcal are following through right at this very moment? James Nevile: Right now, what we've got running in the pharmacies is a range of activities. The main one that you've alluded to there is our Healthy Heart campaign, and this is about trying to prompt some action from Australians to get them thinking about their heart health, and potentially get them proactively starting to manage some of their risk factors and re-engaging with their GP and other healthcare professionals. Warrick Bishop: Look, I think engagement and encouragement are fundamental in terms of moving people towards better healthcare. I understand that Amcal have been involved in some surveys, and it's certainly shown some differences between the sexes. Would you like to tell me a bit about that? James Nevile: Yeah, absolutely right, Warrick. Amcal's research reveals that Australian men are almost sort of putting their lives at risk by failing to proactively manage their own health. In fact, what the research showed that was over 40% of men said it would take a life-threatening health scare for them to start to take their health seriously and get proactive. Warrick Bishop: Yeah, it's a scary bit of research that, and I have to say that it seems counter-intuitive when a lot of the blokes I know will go out of their way to make sure that their outboard motor is well serviced, so that when they go out fishing they don't have a calamity or a disaster, yet when it comes to their own health, there's a real blind spot there. James Nevile: That's exactly right. I mean, it seems to be that we're much more focused on our boats and our cars than we are on our own heart, which is really, disturbing. Warrick Bishop: It certainly is, but even beyond the individual, what sort of impact is this having on the families because I understand some of your survey questions were around the impact this could have on family members. James Nevile: Yeah indeed, so many of the younger generation were worried about their fathers and thought that 'Hey, maybe they won't be around long enough to see their grandkids grow up.' Sadly, some of these concerns are warranted given that one in four of the millennial generation said that they've lost a parent to heart disease already. Warrick Bishop: Yeah, there is no question this is a condition that impacts not only individuals but the people around them, the people who they love, their friends, and the people in their workplace. Look, if there are men out there who are, if you like, a little bit complacent, or have realised that they're a little bit guilty of not giving themselves the same attention that they're giving to their car or their boat, what would be the sensible first steps you'd recommend they take? James Nevile: Well, you know what? What we find with a lot of blokes is that they are reticent to go and see their GP, whether it's a co-payment, whether it's just the hassle of having to make appointments and all that sort of stuff. If you can get your dad, or your uncle or your partner to go and see the GP, that's fantastic, That's a great first step. What we've done with the Amcal pharmacies is to try and put a step even before that, if that's an easier step for blokes to take, which is heading in, having a chat with the pharmacist, and they run you through some of the risk factors for heart disease and help you understand your own risk. What we've found is that initial conversation with the pharmacist can be a really good first step, and give the bloke a bit of a nudge towards their GP. Just that little bit more information without having had to make an appointment, or anything like that, without having to incur any cost, and then that's enough to kind of motivate them to go off and make that GP appointment. James Nevile: That's exactly right. Yeah, exactly right, Warrick. A lot of the time, you know, I know with work myself, it's hard to go and see the GP, but you will go if you know there's something serious that you need to discuss, and so this helps people to understand what it is they might need to discuss with their GP, and give them that bit of a shove in the right direction. Warrick Bishop: Yeah, no, I mean, all journeys are a number of steps, and the first requirement is to take even a small step in the right direction. I think this is a great initiative, and in fact, to some degree, it really leads us to a question about integrating care for an individual within the community, and how there's this great opportunity that Amcal are trying to work in conjunction with general practitioners to raise awareness of heart risk with patients, and holistically provide the best outcome for those individuals. Would you like to speak to that? James Nevile: Yeah, I mean, what we've noticed over time is just that hell of a lot of research that people that are more educated about their health, people that have more information about their own health, whether it's knowing what their blood pressure is, whether it's knowing what their latest diabetes test is, whatever that information is, as long as they're helped to understand that information, the more they know about themselves, and the more they proactively take ownership of their own health, the better the outcomes they get. We think that rather than having a pharmacy sort of centred approach where pharmacists are the centre of the world or a GP-centered approach where the GP is the centre of the world, we strongly believe that empowering patients with additional information, and then helping them to, I suppose, create their own little healthcare theme around them to make sure that they've got the GP that they're seeing regularly, they've got their pharmacist that they see regularly, and if they're on medicines, that pharmacist knows the regular medicines they're on, any allergies they might have. Equally, getting off to see your physiotherapist, if that's what you need, getting off to see a dietician if that's what you need. The more information you can have about your own health, we know you'll get a better outcome. Warrick Bishop: Look, I think, certainly from my own experience consulting and seeing patients, there's no question that patients get the best care if we're all working together, and interacting, and dovetailing with the services that we provide, not working individually in silos, for want of a better term, so this professional working network supporting the patient to get the best outcomes. It's fantastic that Amcal is starting a process in that preventative space for heart disease. James Nevile: I was just going to say one of the key things about the current heart health campaign is that whilst there are some things that we can talk about in pharmacy and things like blood pressure we can happily measure in pharmacy, there are other things that are best measured at your GP surgery. Part of the materials that you receive when you go to the pharmacy include elements that the GP needs to fill out. We're encouraging patients to take those materials and then go off to their GP. It really is making that patient, I suppose, understand a little bit more easily how it is that they should take the next steps, and then when they get to the GP, they're not getting a sort of half message, that the GP can clearly see what the patient's already had done, and what they still need. Warrick Bishop: Yeah, look, I'll touch on that momentarily because I was delighted to be involved in some of those discussions, actually, with yourself and the team putting this intervention together. The opportunity to use a validated risk tool, which is the Australian Cardiovascular Risk Calculator and begin that process to invite that patient to then follow up with the GP to complete that process, strikes me as a very positive step in terms of using an appropriate tool and using both coalface and GP input to deliver the best assessment for that individual patient. James Nevile: That's absolutely right. It's important that any of this sort of health information is people are given it, that they're helped to understand it. It would be unfortunate if somebody got a result that then caused worry for them that they misinterpreted, but I think the fact that some of these basic things are being sort of offered in the community pharmacy setting, where there's a health professional, in the pharmacist, there to help them understand, and then other results that the GP is obviously measuring in the GP setting are able to be interpreted by the GP. I think that's really important, that people are given that information, but then also helped to understand it as well. Warrick Bishop: Look, I'm just going to invite you to offer any extra bits and pieces. I did have, on my list of questions, some of the common myths surrounding heart health. I don't know if you want to touch on that, or if there was anything specific you wanted to mention before we look to wrap up. 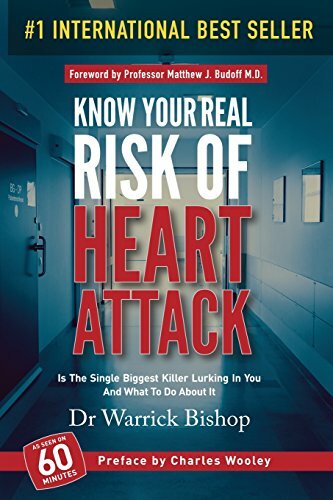 James Nevile: Look, Warrick, I think for me, there's a lot of people out there that have all sorts of myths about heart disease, and cardiovascular disease. I think the big message, for me, for your listeners would be if they're worried about a loved one, whether it's their dad, their brother, their uncle, their cousin, make sure you have a bit of a chat to them, see if you can encourage them either to go and see a pharmacist, go and see their GP, just to get their risk factors checked. We all know that things like being a little bit overweight, being a smoker, having a family history of heart disease, are things that can put you at higher risk, and so being proactive, and just giving your loved ones a bit of a nudge in the right direction, is your best course of action. Warrick Bishop: Yeah, look, I think that's really valuable. I guess, in summary, what we've covered today is that Amcal have the initiative to improve awareness for the cardiovascular risk that's running right now, but I understand it'll continue throughout the year. Is that right, or not? James Nevile: That's right, Warrick. It's available whenever people are interested in learning more about their heart health. They can drop into any Amcal, and the pharmacist will be able to take them through these risk factors and help them understand what's relevant for them. Warrick Bishop: So, attention is being brought to it right at the moment, and for this next month, which is fantastic, but it's available ongoing. That opportunity means that men, who we've defined through your survey work, are a little bit complacent about looking after themselves in that space. That means men who have issues with timing, or just getting to the doctor, may be able to find an out of hours solution to start that process through the pharmacy, that the pharmacy process actually dovetails with what the general practitioner would do, and that there's an opportunity for family members to support their loved ones through this process of awareness, appropriate assessment, and appropriate management just to reduce this burden, this tragedy, of heart disease. James, I'm going to wrap it up there. I'm really grateful for your time this morning, so thank you for sharing, and I genuinely hope that this heart health intervention by Amcal goes as well as we're all hoping. James Nevile: Thanks very much, Warrick. It's great to be on, and as I said for your listeners, make sure if you are worried about yourself or any of your loved ones, take that first step and understand the risk factors because it's never too late to start changing some of those things that might contribute to either a heart attack, a stroke, or something else. Warrick Bishop: Well, you get nothing from agreement from a preventative cardiologist like myself on a parting remark like that. Again, thank you once more, James, and I wish you the very best. You have been listening to another podcast from Dr. Warrick. Visit his website at www.drwarrickbishop.com for the latest news on heart disease. If you loved this podcast, feel free to leave us a review.